The Detroit Tigers continue to hold the top spot in Box-Toppers team rankings for the third week in a row, while the Tampa Bay Rays make a big jump to second place. Tigers players have accumulated 99.3 Box-Toppers points this season, the most of any team. Last week's hot team, the Texas Rangers, fell to third place with 95.0 Box-Toppers points. 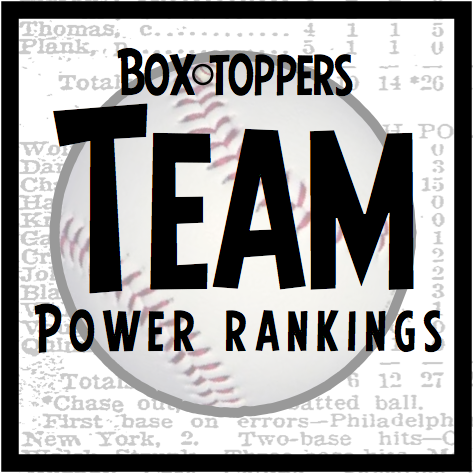 The St. Louis Cardinals, in fourth overall, remain the top National League team in Box-Toppers points with 94.4. But the Los Angeles Dodgers continue to inch closer—with 94.0 points, they trail by only 0.4. The Cincinnati Reds are the hottest National League team for the second straight week, picking up 6.5 Box-Toppers points, giving them 92.2 points. However, the Reds still fall in the overall rankings from sixth to seventh place.